They can be used in the purpose of conveying several of freights and conduction of materials in the machine and assembly line and transferring to one another. Parts of goods, angled and cylindrical materials, products-wracked can be conveyed in a horizontal or sloping way. 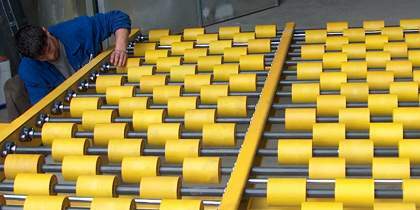 Products are conveyed on the rollers, which have intermittently fixed on the conveyor frames. There are two available types of conveyors that have been separated as an actuating roll or free roll conveyors according to their functions. The conduction of materials is supported with a height difference, and the first time accelerated system is supported with the man or machine power in free roll conveyors. The force in these kinds of conveyors is directly applied on materials. The Rolls are rolling with friction of freight, which makes the progression movement towards the conveyor bearing. The rolls in actuated roll types of conveyors are actuated with the help of a chain, which works in the engine-reduction system and rolls towards the conveyor. The actuated conveyor rolls are turned in its own rotate by an engine. The movement of conveyed material is done with the help of friction. The gaps of rolls, diameters of rolls, and materials are determined according to the type of product. Galvanize, rubber or PVC covered rolls are concordantly designed for customers use. The application area and capacity has differences for usage purposes.